Because we rely on the wind for our flight path, even our “standard” flights are always unique! Enjoy a spectacular and scenic ride from any of our Primary Launch Sites. 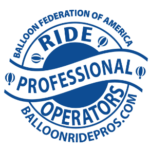 Reserve your own balloon, chase vehicle, pilot and crew: no other passengers will be scheduled in your balloon and you will have the gondola to yourself. Price covers you and one guest. You may schedule up to two additional guests on your flight at the price of $260 per person. Private package as above, but we launch early. We check in for the flight at zero – dark – thirty. We hold our passenger safety briefing, and inflate the balloon. The balloon is equipped with special Aviation Position Lights for night flight. We lift off the ground approximately 20 minutes prior to sunrise: and as the sun breaks the horizon, you drop down on one knee and pull out the ring. What a memory for the rest of your life together! Ride to an altitude of 10,560 feet (yes, that’s two miles!) above sea level. We may even be looking down on a cloud or two (though if there is a solid cloud layer, we can’t go through it). 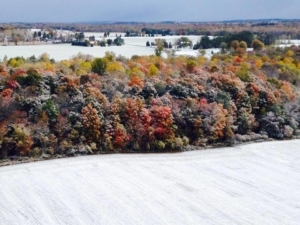 Bundle up, and get ready for a spectacular view of the Finger Lakes region! Fly away from your own back yard, or somewhere near your home. To see and photograph your own home, farm, or area from the air is really special. $260 for each additional passenger, if more than two. Max of 10 passengers with 3 balloons. Add $100 or more travel if more than one hour from Groveland, NY. **Remote launch sites are available across the region, including — but not limited to — Seneca Falls, Geneva, Hammondsport, Watkins Glen, Trumansburg (Ithaca area), and Penn Yan! 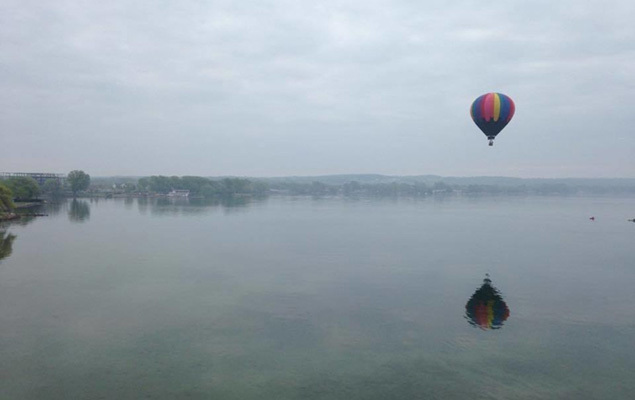 We have launch sites available for spectacular flights over and near any of the Finger Lakes, including Canandaigua, Conesus, Keuka, Seneca, Cayuga, Owasco and Skanaeateles Lakes. For a more complete and specific listing of available launch locations, please visit our Remote Launch Site page. If you’re looking for a place to stay, check our B&B ballooning page for some great suggestions of inns, where you can FLY from where you STAY! Make a grand exit from your wedding reception by flying away in a hot air balloon! 1) Tether package: Entertain your guests in style. This package works especially well for an afternoon wedding following the ceremony, as guests are arriving at the reception and the wedding party and family are having photos done. The balloon rides offer great entertainment while they await the arrival of the bride and groom! 2) Horse and Carriage: Yes, Liberty Balloon Company also offers this elegant form of transportation. With a team of stately, pure-bred Friesian horses, trainer and driver Carroll Teitsworth treats guests to rides in a beautiful carriage. 3) Combine the balloon AND the horse and carriage, and receive discounts on both, AND have a “bad weather” backup! **With all wedding or event packages, we cater to you; by nature each package is highly customized. Please contact us for specific price and planning. Be sure to ask about our preferred vendors, including pre-approved venues and quality, affordable photographers. 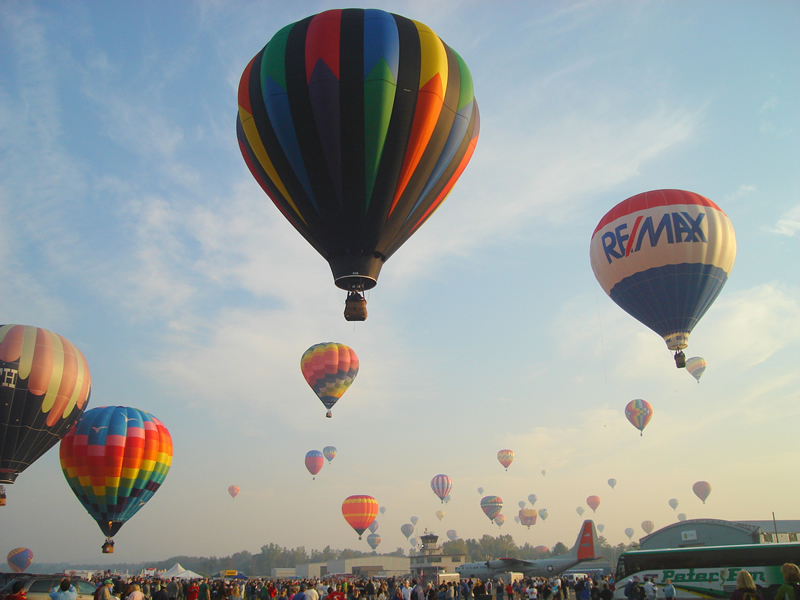 We attend many balloon festivals each year. It’s a great experience to enjoy your flight with other balloons in the air at the same time! 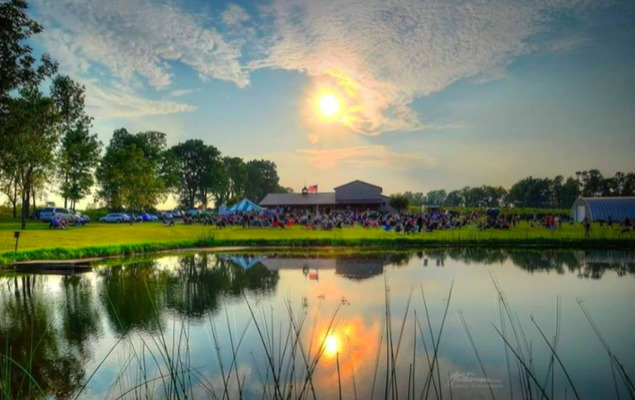 We may attend events including the New York State Festival of Balloons in Dansville, NY, the Spiedie Fest in Binghamton, the spectacular Adirondack Balloon Festival near Glens Falls, NY, the Great Wellsville Balloon Rally, as well as events in Jamestown, Poughkipsie and Letchworth State Park (spectators only). Whether you want a ride, or simply to be around balloons, be sure to look us up — we may just put you to work! Edited, high-resolution 4 – 8 minute video; a beautiful way to capture your hot air balloon ride…and to share the experience with your friends at home! Each ride and each video is unique. Our team makes every effort to capture video of your party during the ride as part of the ride experience. Restrictions apply, based on flight conditions and other factors. Please request this package when scheduling to discuss details. Imagine the serenity you feel on a windless, crisp winter morning. Now imagine you’re above it, floating above the treetops. From higher altitudes, the clear air allows you to see way, way into the distance. This is the beauty of the Winter flight package! Winter Flights are offered December 1 through March 31. $260 for each additional passenger, if more than two. Max of 7 passengers with 2 balloons. For your Flight Training Experience, you enjoy the inflation, launch and final landing as a passenger, but during the flight your pilot-in-command will invite you to take the controls, and act as pilot of the balloon. Balloonists refer to this as “logging burner time”. Under your instructor’s guidance, you will experience the surprising challenge of simply flying level; and depending on your interest and capability you will have opportunity to follow his lead in almost every phase of flight from inflation to takeoff, ascents to descents, approaches and maybe even landings. At the conclusion of the flight, you are presented with a balloon pilot’s log book, and invited to make your first entry as pilot of a hot air balloon. If you wish to continue your training and work towards a pilot certificate, Liberty Balloon Co. offers ongoing flight training and a wealth of materials, expertise, and teaching experience to help you achieve your goal of becoming a save and capable pilot. Launch from Tannersville or Hunter in the Catskills. 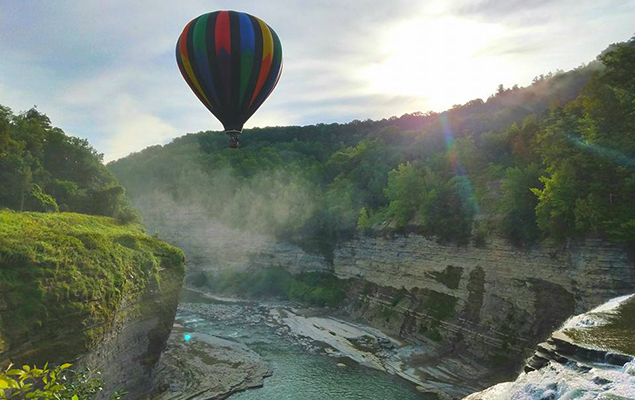 Float over the spectacular terrain, dipping into valleys as you go. 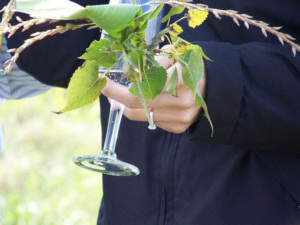 See the mountain wildlife, pick leaves, and appreciate nature in a whole new way! Conclude your flight in the Hudson Valley where there are fields and other suitable, accessible landing sites. Contact us with your idea. We will work with you to create a unique experience all your own! Depart from the Connecticut shore, and land on Long Island! We have a chase boat following in case the wind shifts in an unfavorable direction. Join the elite ranks of balloonists who have made this unique flight across the Long Island Sound! 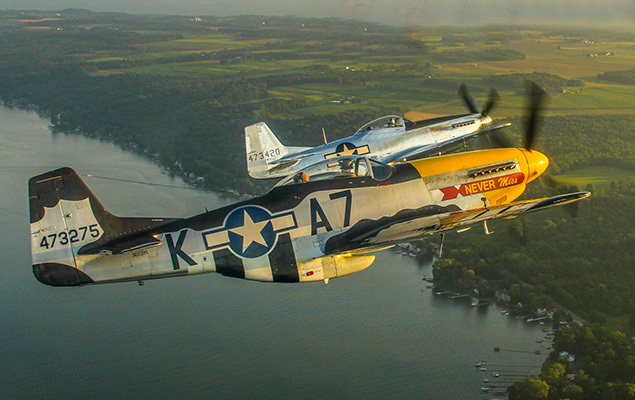 This flight depends on a very delicate combination of wind and weather conditions for success. We want enough wind to cross the sound, but not too much for landing. We want a North wind to carry us across. A Northeast wind would carry us toward LaGuardia, a northwest wind would take us to the Atlantic. We will recruit a chase boat or two to chase, in case we need a tow…and to help set your pilot’s wife’s mind at ease. We will watch the forecasts, and when the weather seems to be developing favorably, we will go to the Connecticut shore the night before. Next morning if the weather is good, we go. If conditions are not correct, we try another time. 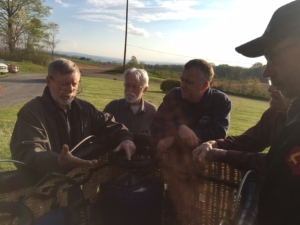 Once we have completed the flight, you will have joined a very elite cadre of balloonists who have CROSSED THE SOUND!